Girl Scouts Karen Jean Dumitru of La Mesa, and Christina Bailey and Jessica Bailey — Santee residents who are sisters, were honored as top cookie sellers by Girl Scouts San Diego during the 15th annual Operation Thin Mint® Sendoff celebration aboard the USS Midway Museum. Operation Thin Mint® (OTM) is a unique local program in which Girl Scouts team with generous cookie customers to send “a taste of home and a note to show we care” to deployed military troops. Since the program’s inception in 2002, more than 2.7 million boxes and countless handwritten notes of support have reached U.S. Navy, Marine, Army, Air Force and National Guard troops aboard ships and stationed in places around the world, including Africa, Asia, the Middle East and the South Pacific. This year, cookie customers donated 159,198 boxes to U.S. service men and women. 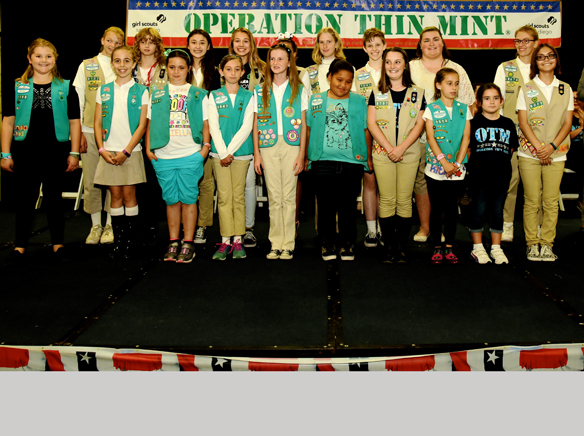 Eleven-year-old Karen Jean, a member of Girl Scout Troop 6743, sold 2,107 boxes, with 116 donated to OTM. Christina, 14, and Jessica, 17, are independently registered Girl Scouts (i.e., not in a troop). They each sold 3,072 boxes, of which both secured 100 for OTM. The Girl Scout Cookie Program is the world’s largest girl-led enterprise, teaching girls like Karen, Christina and Jessica about money management, goal setting, decision making, people skills and business ethics. All proceeds stay local to support Girl Scout troop activities, volunteer trainings and programs, including Girl Scout summer camp.